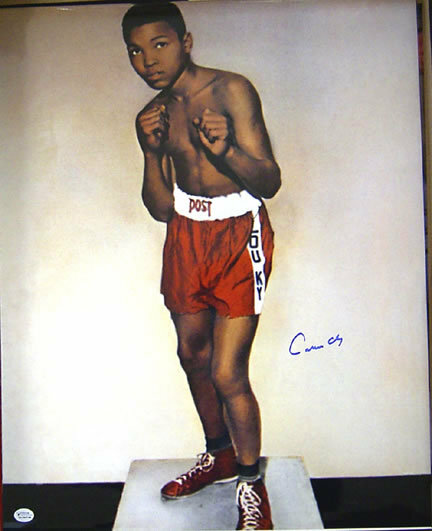 Clay was first directed toward boxing by the white Louisville police officer and boxing coach Joe E. Martin, who encountered the 12-year-old fuming over the theft of his bicycle. However, without Martin's knowledge, Clay also began training with Fred Stoner, an African-American trainer working at the local community center. In this way, Clay could make $4 a week on Tomorrow's Champions, a local, weekly TV show that Martin hosted, while benefiting from the coaching of the more experienced Stoner, who continued working with Clay throughout his amateur career. 1954: When Clay was 12 years old, his bike was stolen. Although he did report the crime, he also promised to ‘whup whoever stole it’. The policeman to whom he reported the crime took him under his wing and directed him to boxing trainer Fred Stoner with the idea of channeling Clay’s aggression. Over the next 6 years, Clay went on to win six Kentucky Golden Gloves championships, two Amateur Athletic Union crowns and two Golden Gloves titles. At the age of 12, a curious incident set young Cassius Clay on a new path. On an October afternoon he rode his new bike to the Columbia Auditorium. Later, when he went back to get it, it had been stolen. Someone told him there was a police officer in the basement, so Clay went down there. The basement turned out to be a boxing gym—the officer, Joe Martin, was a boxing enthusiast with his own gym. After listening to his volley of threats against whoever stole the bike, Martin invited him to come around to his gym and learn something about boxing.